"Highly readable work of novel ideas and fresh concepts; remarkably stimulating, and intellectually memorable. Highly recommended!" The Columbia Review. “Mythos and Cosmos: Mind and Meaning in the Oral Age” by John Knight Lundwall, Ph.D. is a comprehensive book that presents a fresh perspective on the vast known (and misunderstood) record of human myths and human view of its place in the universe. In a thorough and fascinating introduction, the author lays out the ‘myths about ancient myths’ propagated by three types of students of human myths: Howlers, who view ancient people as barbarian simpletons who occasionally and accidentally built unique structures and told tall tales; Romantics, who think of ancient people as spiritual ‘one with nature’ folk and who navigated the world and created unique structures by way of feelings, purity, and sensuality; and the Conspirators, who think that the ancient people were neither creators of anything nor spiritual thinkers of any quality, but rather the beneficiaries of superior aliens, who created myths and pyramids. As the author painstakingly and ably proves, all three approaches overreach with varying amounts of false-assumptions while shortchanging the ancient people and their depth of knowledge and capabilities. In “Mythos and Cosmos: Mind and Meaning in the Oral Age,” author John Knight Lundwall, (Ph.D., Comparative Myth and Religious Studies, Editor in Chief, Cosmos and Logos: Journal of Myth, Religion, and Folklore.) successfully presents a broad spectrum of facts, analysis, and creative concepts on a subject of great interest and relevance. 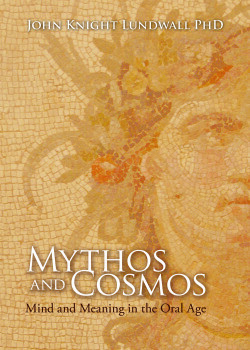 The book covers the history of myth and ancient scientific record, the intertwined richness of both written and oral human accounts since antiquity, the history of human observations and ideas about cosmology and celestial bodies, the impact of cosmology on ritual and cult practices, and a most detailed discussion of three central myth cycles: the Epic of Gilgamesh, the Labors of Heracles, and selected Old Testament stories. In summary, “Mythos and Cosmos: Mind and Meaning in the Oral Age” by John Knight Lundwall, Ph.D. is truly a magnificent work of research and presentation that will be devoured by those interested in myth, religion, philosophy and human history. The structure of the book is logical and helpful, the facts and historical findings are presented in an accessible, interesting manner, and conflicting approaches are described with fairness and considerate thoroughness. While this book meets high academic standards of meticulousness and objectivity, it is highly readable, easily understood, and offers novel ideas and fresh concepts that are thought provoking, remarkably stimulating, and intellectually memorable. Highly recommended!